The staff at the Valley Animal Center in Fresno, California, were in “complete shock” when an extremely neglected poodle was handed over to them. The team immediately set about creating a miracle for the little furry one. Jareth, a 5-year-old dog, had been through a very stressful situation of neglect—the pup’s fur was terribly matted like anything. “Our staff was in complete shock as they carried him into our adoption center,” Devon Prendergast, community relations coordinator for the animal shelter, told The Dodo. The staff had no option but to anaesthetize Jareth to remove the incredibly matted coat he had been forced to endure. “Our animal care team rushed him to our clinic within the hour, and due to the severity of his condition, had to sedate him to remove all the excess fur,” said Prendergast. Jareth was a different dog under all that shocking tangle. 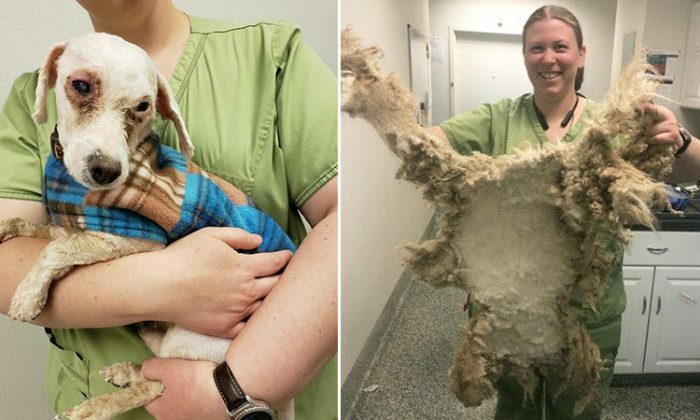 The rescuers worked hard to shave off the pounds of matted fur from the pup’s body. At last, the sweet poodle had a chance to let his nature shine through. “Although he suffered severe trauma and neglect, just four days after having all the matted fur removed, Jareth is now vocal and full of energy,” Prendergast said. The best part is Jareth will soon be hoping for a forever home to enjoy, as he is being readied for adoption.